I cannot accentuate vowels (or any other letter) in the chat of Skype using dead keys (in the Spanish keyboard-layout) as I do in other applications, where I type "´" and then "e", resulting in "é". In Skype will appear "´e" instead of "é" . This is relevant because I frequently write in Spanish, a language in which accents are important. The problem is not with the system itself, nor the keyboard-layout, since I can accentuate in any other application, like for example in here áéíóú. Also, I believe it is not related with the language set for Skype, provided I tried out different possibilities. EDIT: As indicated by @cipricus, this problem does not seem to be a qt issue. Therefore this question is not a duplicate of How to use the compose key in Qt apps?, and the solution provided there (install the package ibus-qt4) does not work in this case. See the comments by @cipricus for more information. I can confirm your problem with all keyboard layouts that use dead-keys. The Spanish layout uses dead keys to type certain characters. I type " ´ " and then " e ", resulting in " é "
From Applications/Slingshot launch 'Language Support' (gnome-language-selector - part of language-selector-gnome). 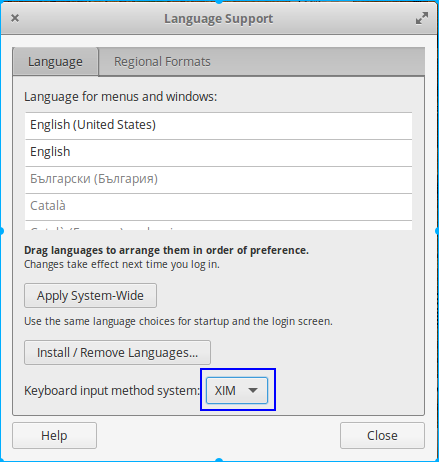 Set 'Keyboard method input system' to 'XIM'. This problem seems partially related to this askubuntu question: Dead keys (accents) stopped working after upgrading to Ubuntu 16.04 and even to this bug which refers to Spanish, with the notable difference that here only Skype is affected. As indicated here, this may seem related to a more general problem affecting Qt applications. Trying the solution thereunder (install and run qtconfig-qt4, go to the Interface tab,under Default Input Method, select ibus) it doesn't seem to work. (Initially only xim is available there, not ibus; but that option appears after installing ibus-qt4. Enabling that option doesn't fix our problem though.) - Possibly this is not a qt issue. 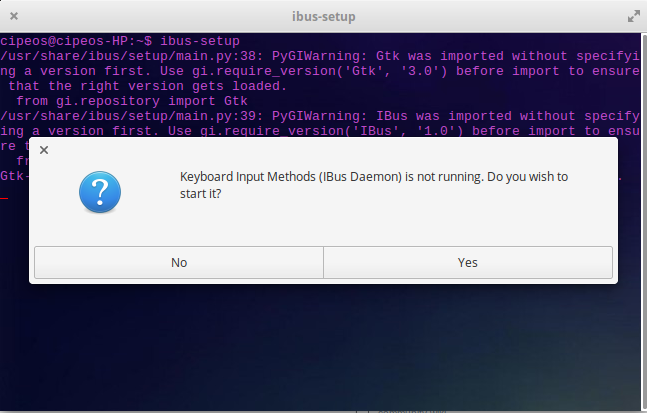 There seems to be a temporary fix indicated in the answer under the askubuntu linked question that says to open a terminal and type ibus-setup. As those settings doesn't seem available in elementary, I just went to Skype and now the dead keys work. (Adding just ibus-daemon as indicated in another answer under that linked question doesn't fix it.). Not the answer you're looking for? Browse other questions tagged release-loki keyboard layout skype or ask your own question. What Skype do I need to download?